The Aid and Attendance benefit, available through the Department of Veterans Affairs, is a non-service connected pension benefit for Veterans and spouses who require the aid and attendance of another individual to perform the personal functions required in everyday living. This benefit has proven to be very helpful to those Veterans and/or spouses who reside in assisted living facilities. In order to qualify for the Aid and Attendance benefit, there are both service and financial eligibility requirements that the Veteran must meet. If the applicant is the surviving spouse of a Veteran, the deceased Veteran must meet the requirements and the spouse must also meet certain requirements of their own. Proper estate planning may be necessary for the Veteran and/or spouse to qualify for Aid and Attendance benefits. 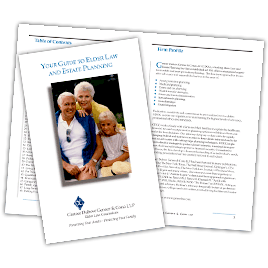 Genser Cona Elder Law attorneys are leaders in the field of Elder Law and Estate Planning and are accredited by the Department of Veterans Affairs to represent Veterans and their families. Genser Cona Elder Law is committed to helping Veterans and their families plan for their future needs, prepare to meet the costs of care, and protect assets for the next generation.